In the race toward technological maturity, driverless cars might be moving ahead of the social maturity needed to keep them in line. See what devs will need to consider. As driverless technology has advanced, there has been a number of moves to better understand their potential relationship with pedestrians. For instance, researchers from the University of California, San Diego looked at how driverless cars can correctly recognize pedestrians in real-time. Or you have Drive.ai, a start-up that is developing communication systems to allow driverless cars to interact more effectively with their surroundings, such as indicating that the car is allowing the pedestrian to cross the road for instance. 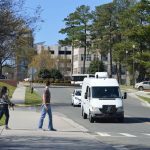 A recent study from UC Santa Cruz has taken this a step further and examined how pedestrians may fare in a fully driverless world. It utilizes game theory to test the interactions between driverless cars and pedestrians. It posits that because driverless vehicles are designed to be risk averse, it will create an environment where pedestrians can largely act with impunity, which in turn is likely to make neighborhoods much more pedestrian-oriented. Whilst this clearly benefits pedestrians, it may have implications for the speed with which vehicles traverse our towns and cities. Pedestrians today often make explicit trade-offs between the speed of crossing a road and the risk of harm they may incur. As driverless cars are likely to be programmed not only to obey the laws of the road, but also to prevent any harm from happening to pedestrians, it gives the pedestrian the upper hand safe in the knowledge that the car will always yield to them. It’s an interaction that promises to fundamentally change not only urban transportation but quite possibly the very design of our cities. I’ve written before about the possible productivity gains of driverless cars, with many existing studies being as skeptical about these potential gains as this latest one. “From the point of view of a passenger in an automated car, it would be like driving down a street filled with unaccompanied five-year-old children,” it concludes. It suggests that if productivity gains are to materialize, it will require not just technologists but policy makers and planners to work together. For instance, pedestrian crossing may be discouraged entirely to try and ensure vehicle speeds, or urban centers could become more pedestrian-orientated. One thing is for sure, it will require a degree of change that I think we are in little position to predict right now.